Ointment on hand. Applying the ointment in the treatment and hydration of the skin . A recent study found that patients who use compounded topical pain cream to treat localized chronic pain may be no better off than patients using placebo. The randomized, controlled trial, published in the Annals of Internal Medicine, took place at a military treatment facility and included 399 patients with localized pain classified as neuropathic (n = 133), nociceptive (n = 133), or mixed (n = 133). Patients were treated with either a pain cream targeting their type of pain (neuropathic pain: ketamine, gabapentin, clonidine, and lidocaine; nociceptive pain: ketoprofen, baclofen, cyclobenzaprine, and lidocaine; or mixed pain: ketamine, gabapentin, diclofenac, baclofen, cyclobenzaprine, and lidocaine) or placebo. 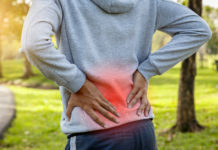 The primary outcome was one-month pain improvement, defined as a pain score reduced by at least two points combined with a score greater than 3 on a 5-point satisfaction scale. Researchers observed no difference in mean pain score reduction between the treatment and placebo groups in any of the pain classifications— neuropathic pain (−0.1 points [95% CI, −0.8 to 0.5 points]), nociceptive pain (−0.3 points [CI, −0.9 to 0.2 points]), or mixed pain (−0.3 points [CI, −0.9 to 0.2 points])—or for all patients (−0.3 points [CI, −0.6 to 0.1 points]). Positive one-month outcomes were observed in 36% (n = 72) of the treatment group and 28% (n = 54) of the control group (risk difference, 8% [CI, −1% to 17%]). One of the study’s limitations is its short follow-up time, the researchers noted.